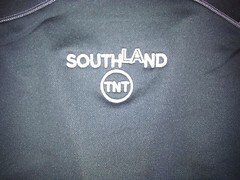 I watched an episode yesterday and Southland is interesting. It is different in the sense that there is no excess glamour and seeing it made me feel like I was watching a real police reality show. Based in Los Angeles and starring Among others REgina King who also starred in the comedy "Miss Congeniality 2: Armed and Fabulous," . I felt like this was shot by a camera following real police officers. From Emmy Award winners John Wells, Ann Biderman and Chris Chulack comes a raw and authentic look at a police unit in Los Angeles. From the beaches of Malibu to the streets of East Los Angeles, "Southland " is a fast-moving drama that will take viewers inside the lives of cops, criminals, victims and their families. Michael Cudlitz ("A River Runs Through It ") plays John Cooper a seasoned Los Angeles cop, assigned to train young rookie Ben Sherman (Ben McKenzie, "The O.C ."). Cooper's honest, no-nonsense approach to the job leaves Sherman questioning whether or not he has what it takes to become a police officer. Michael Cudlitz ("A River Runs Through It") plays John Cooper a seasoned Los Angeles cop, assigned to train young rookie Ben Sherman (Ben McKenzie, "The O.C."). Cooper's honest, no-nonsense approach to the job leaves Sherman questioning whether or not he has what it takes to become a police officer. I may not have started watching this if not for the prompting from Klout and that is more so because I feel like there are many Police dramas to watch. But this one seems different. Hope to watch another episode next week and report back. Are you watching TNT? what is your opinion? What dramas do you recommend TNT or otherwise? Is your tweet audience International ?